My 8 AM call didn't answer, which gave me an extra hour of quality Saturday morning snuggle time. 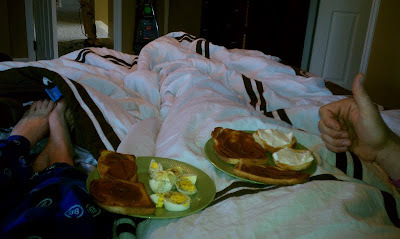 I broiled up some toast and bagels and brought Dan-the-Man breakfast in bed! I was able to get 30 minutes in between calls to hop on the treadmill. I kind of stuck to the "sprint" workout plan. I ran at 6 mph for 5 minutes then at 7 mph for 1 minute then 6 mph for 4 minutes then 7 mph for 1 minutes and so on like: 5-1-4-1-3-1-2-1-1-1. Then I went 10 more minutes at 6 mph. It wasn't too bad until I got to the last 10 minutes and I was SPENT. I guess I am lacking in the endurance department. Distance-wise I barely ran more than I would if I had run at 6 mph the entire 30 minutes, but heart rate-wise I could feel a huge difference. Weird, huh? I think I will try to Google some better treadmill workout plans. Tonight I am going to sample my first South African drink. So excited! Tomorrow is my day off from running. Whew. Also, Chiefs game! I already have a pork roast in the crock pot for some pulled pork sandwiches. Mmmmm!